Creating the Mosaic of Your Dreams. Our company offers the highest quality workmanship in tiling where no job is too small! From the smallest of cloakrooms to the largest of kitchens and bathrooms, en Suites, whole floors and walls, commercial or residential. 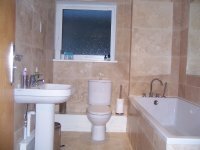 We are also offering a full bathroom installation service and handyman service, where we will be happy to take on jobs such as putting up of shelves, cupboards, putting flat pack furniture together, etc.